Fluidfax is a network fax server solution that reduces the costs of faxing by enabling users to send and receive faxes directly from their desktop. With the convenience of not having to leave their desks or stand in line at the fax machine, tremendous amount of time is saved every day. By treating faxes as electronic documents, Fluidfax eliminates the need to pay for the supplies of paper and toners of traditional fax machines. Desktop faxing means no more standing in line at the fax machine every day, saving tremendous amount of time. Send and receive faxes as paperless documents eliminates the recurring costs for paper, toner and maintenance when using fax machines. Consolidate separate fax lines with fewer shared lines with Fluidfax at one central location. This reduces the number of telephone lines and the effort to maintain each individual fax machine thereby further reducing costs. Organizations can track and control who sends and receives faxes. This improves confidentiality, security and compliance (HIPAA, Sarbanes-Oxley etc.). All sent and received faxes are archived electronically. Fluidfax can be set up and managed very easily without extensive computer background or certifications. It runs smoothly in the background with minimal administration. 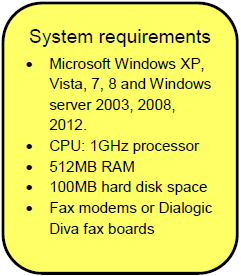 The licensing is designed to offer enterprise faxing capabilities at a small business price. All businesses stand to benefit from using Fluidfax. Automate the faxing of critical business documents such as purchase orders and invoices from your financial, ERP, CRM, ECM and Document Management systems. Fluidfax integrates easily with these systems further improving business processes.